I'm sure we share the same dilemmas every holiday. You're an avid fisherman. You love fishing. You love fish. And consequently you always try to book a holiday near the coast in the hope you'll find time to flex the travel rod in between your husband/parenthood duties. And hereby lies the problem. You can't plan your angling. If you're going to pull off the tricky feat of balancing family time and fishing time you're going to have to remain flexible - ready for any opportunities that present themselves during your vacation. While it's relatively easy to have a travel rod and reel handy in a bag along with some simple terminal tackle, there's one issue I've never been able to overcome - the problem of bait. I'm guessing that my own international bait gathering exploits aren't all that uncommon. It started with raiding the free continental breakfast. A couple of bread rolls. A slice or two of ham. Some bacon rind (if you have the luxury of a posh breakfast!) Fine, but I'm guessing you experienced the same, mainly poor results as I did by the time you got to use your stale stash of 'bait'. Then you probably progressed on to the bakery. You must have seen the mullet in the local harbour and bread feels like a good bet. You've seen locals using it too. Well, I admit as soon as I went to the effort to pack a collapsible cloth bucket, 'to do groundbait properly' I did start to catch a few small mullet. But all the while I was thinking of what else lurked in the depths. I can catch mullet at home! Maybe in the same break, if you started getting desperate, or consequent trips when you'd had time to think about the key to success, you ended up at the supermarket fish counter. A couple of squid. A bag of prawns. Suddenly feels much closer to what you're used to and success seems much more achievable now. But you have to bide your time until you can fish with it. All the while that smelly bait, so perfect to attract some decent/interesting fish, is having the opposite effect on those sharing your holiday with you. I've lost count of the bait-smell related 'discussions' I've had with the missus on holiday. It's not going to ruin the holiday but it becomes all too stressful - you're on holiday! And so to my revelation - Light Rock Fishing or LRF. LRF is an ultralight style of lure fishing, where you should use the best fly fishing rods and reels. Line can be as light as around 2lb (with 5lb much safer to start with), rods rated up to 7 or 10 grams only, sometimes tiny hooks between sizes 12 and 2 and one to three-inch lures to match. At this scale every critter found around the jetties, harbours and rock outcrops puts up a good scrap. I've found a personal-species-hunt to be most enjoyable. A fun way to kill a couple of hours here and there. While the thought of learning to lure fish might put you off, LRF is more akin to the kind of bait fishing you may have done as a kid - fishing small ragworm baits up and down harbour walls, perhaps. 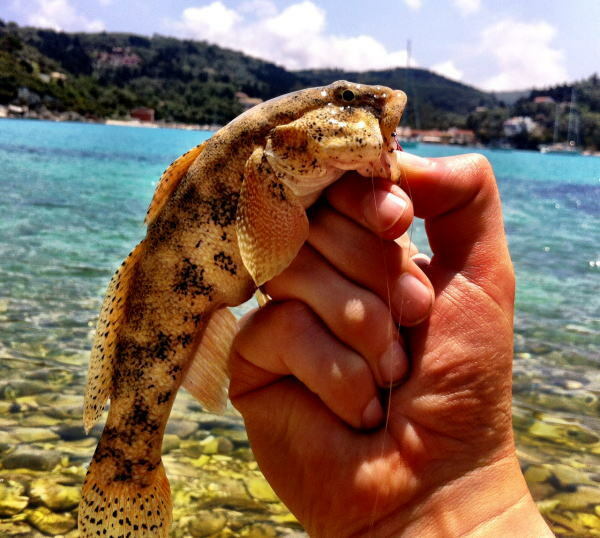 A tiny amount of movement in the lure is often enough to get instant results, especially in the crystal clear waters of the Mediterranean. If you still feel that this would be too far removed from your normal bait fishing then check out the amazing innovations from Japanese lure/bait companies, Ecogear & Marukyu. 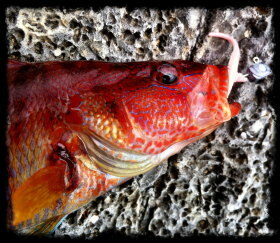 I give you, the amazing Power Isome from Marukyu and the wonderful range of 'edible' lures by the name of Ecogear Aqua. Both are available in the UK through specialist mail order companies. Both are truly edible (don't try this at home). 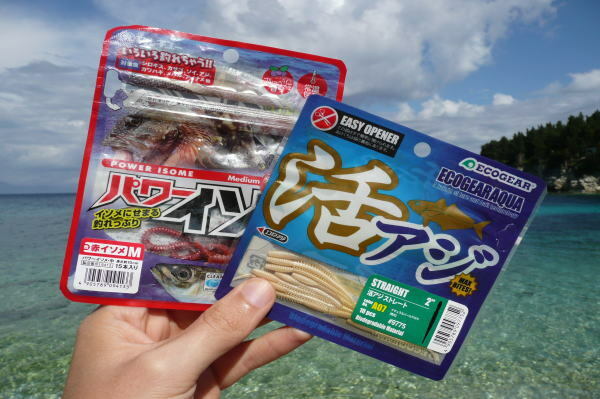 The scientists at Marukyu and Ecogear have formulated a flexible material made from edible substances and formed highly recognisable and detailed lures. These lures are packed full of things that fish like to eat, like Amino Acids. 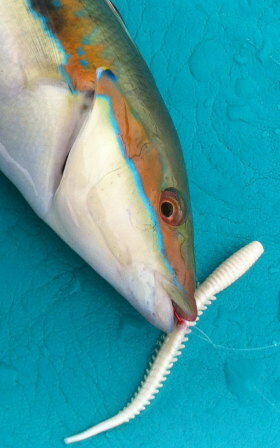 When you tempt a fish to bite your lure, it doesn't want to let go. The jury is still out as to whether these new style artificials are closer to bait than lures, but what matters is that the combination of edible material and well proven lure shapes can prove deadly. Add subtle movement to your new-style 'baits' and if there's fish there, they'll make their presence felt. I've just come back from a week on the isle of Paxos, in Greece. It's much the same as many Mediterranean holiday destinations - hardly an angling Mecca - but with a couple of packs of Power Isome (small ragworm imitations), a couple of packs of the Ecogear Aqua Straight worms (tiny worm imitations) and a handful of more traditional looking paddletail lures I had a lot of fun, notching up a total of twelve species including, Grouper, Sea Perch, Scorpion Fish (some are poisonous abroad, so be careful!) and weird and wonderful wrasse. Power Isome has one more trick up its sleeve. The smell. In an effort to get more people (boys and girls) into fishing in Japan, Marukyu have made Power Isome smell of... well, berries! So while those 4 day old squid are putting a strain on your love life, these neat little ragworms from Marukyu won't be. Ingenious! 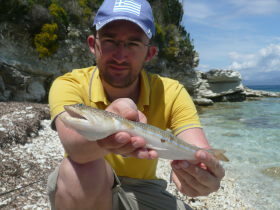 LRF is a growing angling discipline in the UK. There's lots more info to be found online if you're interested and dedicated tackle for those wishing to commit. To be fair, it would be entirely possible to fashion some kit to do the job admirably. If you're a coarse angler, you're well on your way already. But in my experience, two elements are worthy of dedicated attention - line (worth investing in 3 to 5lb fluorocarbon) and the lures (one pack of Power Isome will get you catching). If you need any more help and advice, please leave me a question in the comments section and I'll do my best to help. Good luck and bon voyage! Great bit about raiding the continental breakfast for bait! Thanks!